Despite my long history as a church musician, I have an aversion to plain chant. Maybe I never studied it properly; maybe my brain is just wired for northern polyphony. Those CDs of monks or nuns chanting the Divine Office, said to soothe the over-taxed brain, make me want to dissolve the monasteries. But a family who visited Jumièges Abbey in the summer of 1913 were surprised and delighted at the plain chant they heard in the bare, ruined choir, sung by a chorus of — none. The following case, which appears to be one of collective hallucination, was originally brought to our notice by Mr. E. P. Larken, who has been for some years an Associate of this Society. Mr. Larken wrote to us on July 23 of this year telling us that he had received an account of her experience from one of the percipients, Miss Ernestine Anne, and suggesting that we should obtain further information from her. We wrote accordingly to Miss Anne, who sent us in reply a detailed account of her experience and corroborative statements from the three persons who shared it, her father, mother, and brother. Since the experience occurred on July 6, 1913, the four statements which we print below were all made about two years after the event, but Miss Anne also sent us a short paper written in September, 1913, that is, two months after the event, for an Essay Club, and in all essential particulars corresponding to the later account which we print here, because its form is better suited to our present purpose. I visited the ruined Abbey of Jumieges on the first Sunday of July in 1913 [July 6]. I was accompanied by my father, mother and youngest brother. We arrived at the ruin about 3 p.m., and we proceeded at once to inspect the imposing-looking ruin of the monastic church, called “l’Eglise Notre Dame.” It is the largest and most impressive example of Norman ecclesiastical architecture I have ever seen. It was built cruciform, and the right-hand “arm” of the cross joined on to another much smaller church, which was used as the parish church and goes by the name of “l’Eglise St. Pierre.” The walls of this latter church stand more or less intact, but only the nave of the monastic church remains; and a small number of scattered stones mark the place where the choir was once. Trees and shrubs cover the spot where the presbytery once stood. After we had spent some time in the Notre Dame ruin, we walked on into the Church of “St. Pierre.” We had been there about ten minutes admiring this exquisite fourteenth century Gothic ruin, and I then wandered away a short distance from my companions; I suddenly became aware of the sound of a large number of men’s voices which seemed to come from the open space on our left where the few scattered stones marked the site of where the monastic choir had been. The singing was very soft; the air was quite familiar; I remember saying to myself twice: “I am imagining this! I am imagining this!” and then the music “left” my attention as I heard my father exclaim: “Why, there are the monks singing!” I heard no more singing after that, so I really only heard it for a few seconds. I was so struck with the strangeness of the thing that I determined to pretend I had heard nothing, until I learnt from my companions if their experience had been the same as my own. I found this was the case, and we agreed that the voices were chanting “Vespers” that is to say, they were chanting a psalm in Latin. We tried to think of possible “natural” explanations, but the present parish church was a kilometre and a half from there so the caretaker told us besides which, if the sound had come from there, we should have heard it for longer than a few seconds. It was a very fine day, and I do not remember that there was any wind. We spent about half an hour longer near the ruins without hearing anything else in such an extraordinary way. I wrote an account of this shortly after it took place, which has helped me to remember the facts very well indeed. ASKERN, NR. DONCASTER, July 28, 1915. One Sunday afternoon about the beginning of July, 1913, a party of us motored out from Rouen to view the ruins of the old Benedictine abbey at Jumieges. On arriving at our destination we found the small village nearby (and in fact the whole countryside) absolutely deserted, the entire population having gone to a Grand Regatta Fete which was being held at a town on the banks of the Seine three or four miles away. Not a soul was to be seen about, beyond the concierge at the lodge at the entrance of the grounds in which the ruins stand. We wandered around a bit and presently entered what might have been the chancel of the church in happier days. Now there was nothing but bare walls, with the blue sky of the heavens for a roof. We had not been there many seconds before I became aware of the beautiful singing which appeared to come from quite close to where we stood, and about halfway up the ruined, blackened wall facing us. It was as a choir chanting the psalms at Vespers in exquisite harmony and softly. I could almost distinguish the very words of the Latin. I exclaimed: “Hullo, the monks are singing!” taking it quite as a matter of course, and forgetting that I was not actually in a church but only standing amidst the ruins of what had once been one. Then somebody else in our party said something, and the singing stopped very gently and very softly as it had begun. Immediately after, we explored all around, but there was no one about. Everything was deserted and ourselves the only people near the place. The chanting, whilst it lasted, was very superior to anything that I have ever heard in any church, especially in France. It was on a Sunday in July in 1913. We motored over to Jumieges. It was a lovely hot, clear summer’s day. We went into the ruins of the abbey by the west entrance, and passed right up the great church from nave into choir then turned off into the ruins of the parish church of St. Peter’s, which adjoins the abbey. We were all four standing a few paces apart, looking at the wonderful ruin, when I heard very distinctly men’s voices singing in the choir. When I think of it, I can hear them now trained melodious voices, singing in harmony, the different voices wonderfully balanced and trained. It seemed somehow quite natural; it had not yet dawned on me that it was supernatural. I remained for some seconds held. The sounds were just those of a choir singing under a vast vaulted roof. Then my husband said: “There are the monks singing!” Even then it seemed nothing very strange. I think it was because we felt it was so strange that we spoke so little about it, though we must have uttered exclamations of astonishment and exchanged experiences as we have done since. I may add that no human singing in the neighbourhood could have conveyed the impression of what I heard, which was the harmonies at the end of a plain chant, sung by a well-balanced, perfectly trained choir echoing through a vast vaulted roof. 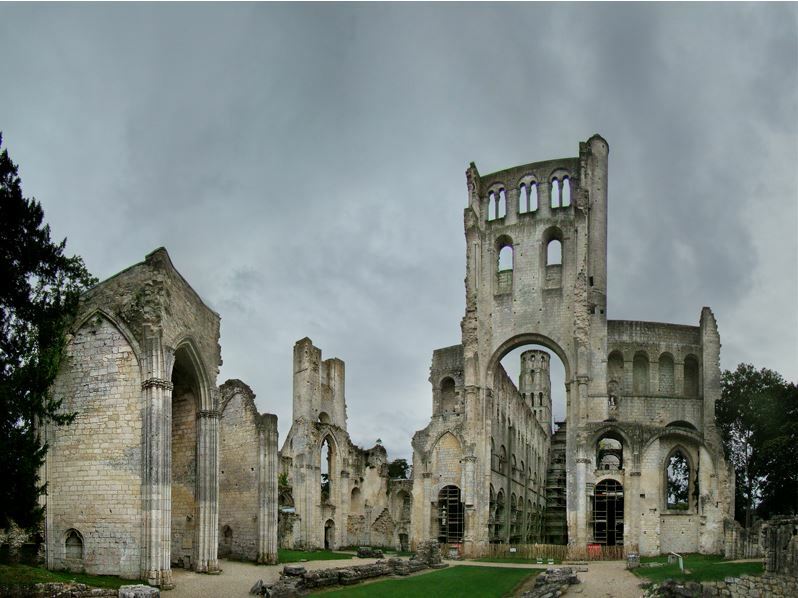 It was a Sunday in July, 1913, that I visited the ruins of the abbey of Jumieges, with my mother, father and sister. We entered the ruins by the west doorway, and proceeded up the church in the direction of the choir. On reaching the sanctuary, or rather what little remains of it, after spending some time looking at the ruins, we turned through the south wall into the smaller parish church of St. Pierre, which is alongside the monastic church. There were no other persons in the ruins or grounds save the members of our party. There was no evidence of any church near by which could have originated the sounds. The singing only lasted about thirty seconds or a minute, and as we spent a considerable time afterwards in the ruins and the grounds, we should have heard any subsequent sounds had there been any. The caretaker at Jumieges certainly said nothing about there being a Benedictine Community living at Jumieges, and I think she would have done, had this been the case, when we questioned her. She said the whole place belongs to the people who own the chateau which is built of stones from the ruin. . . .
As the evidence, therefore, stands at present, it appears unlikely that any chanting such as the percipients heard, should have been actually taking place at the time, but this point cannot be considered clearly established, and the fact that the sounds were heard by all the four members of the party is, so far as it goes, a reason for supposing that these sounds were not hallucinatory in character, but due to normal physical causes. If any of our members have information as to whether (a) there were any monks resident at Jumieges Abbey in July, 1913, or (b) there is in the immediate neighbourhood of the Abbey any ecclesiastical building in which chanting is likely to take place, we should be much obliged if they would communicate with us. Journal of the Society for Psychical Research, December 1915. I was a little puzzled as to why these English tourists would know how Vespers chanted in Latin ought to sound, but the Annes were a recusant family. They had only recently returned to their ancestral manor, Burghwallis Hall, near Doncaster, which had been the home of the Venerable John Anne, a martyr of the English Reformation. The Hall had a priest-hole and a door to a long-lost chapel and had been remodeled in the 1820s to look more “medieval.” Mrs Anne was a writer of fiction and of local history. In Forgotten Shrines by Dom Bede Camm, O.S.B., she is quoted on the history of the house and the lengthy Anne lineage and she waxes romantic about how the Venerable martyr must have celebrated Mass in the hidden chapel, using the very vestments and missal the family still possesses. Something about the tone of Mrs Anne’s remarks in that book suggests a love of the mystical. Folie à quatre? Who was the first to notice the choir invisible? I’m also a little confused by the title of “collective hallucination” when the SPR’s summing up suggests that the chanting was due to “normal physical causes.” While I appreciate that the SPR was trying to be cautious, if the investigators had consulted the entry on Jumieges Abbey in The Catholic Encyclopedia’s 1913 edition, they would have discovered that the building was stated to be in ruins and that “The French Revolution…closed its career as a monastery.” While we cannot completely rule out chanting from Église Saint-Valentin, the Parish church, the time of day seems to preclude it. I’ve written about a similar “collective hallucination” of a phantom fragrance at Glastonbury Abbey.